The East Kent Road Car Company Ltd. dates back to 1916. Its maroon and cream buses were a familiar sight running along the roads of Kent up until the formation of the National Bus Company when the corporate colour scheme of poppy red and white was introduced on the company’s buses and all over white on their coaches. Fortunately for the many bus enthusiasts in the United Kingdom a number of East Kent vehicles have been saved in preservation. Since 2011 the South East Bus Festival has become an annual event on the bus rally calendar, thus providing a showcase for a good number of preserved buses mostly from the south east of England, East Kent being one of the companies represented. Our cameras attended in 2012 and 2014 to record the action at the Kent Showground, Detling, near Maidstone in Kent. We have majored on the East Kent vehicles on this programme, but we have just had to show the other exhibits, as they are too good to be ignored! Our programme opens with the unveiling of newly restored 1950 East Kent Dennis Lancet J3 with Park Royal DP32F bodywork, registration number EFN 584. We take a ride on this superb vehicle around the showground site. We then film the action of many vehicles running around. Some of the companies represented are Maidstone & District, Maidstone Corporation, London Transport and Metrobus to name but a few! There is even a bus from Malta! 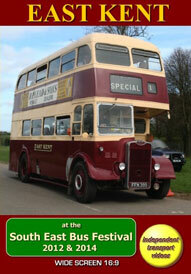 We also see most of the exhibits leaving the ground offering a superb bus and coach ‘traffic jam’. Our cameras return again in 2014. Taking up many different locations on the site, with these vantage points to show off the buses and coaches to their best. Again East Kent takes centre stage, where we see the Guy Arab, AEC Regent Vs and a Daimler Fleetline in action along with beautiful Dennis Lancet single deckers running around the spacious showground. On this visit we take two rides. The first on board East Kent AEC Regent V, a 72 seat Park Royal bodied full front bus with the registration number of PFN 874. The second ride is on Maidstone & District Bristol L6A, SO43 (LKT 991) that has an ECW B35R body. There is plenty of action for you to enjoy featuring many south eastern bus fleets and we even see a ‘New Routemaster’ in service running alongside original RMs and RTs! To conclude our programme we have some archive video from the camera of Malcolm King. Filmed in 1991 in Folkestone and Canterbury we see Metrobuses and Bristol VRTs going about their daily business. We hope you enjoy our programme.